The key is to simply read what is written and then think about it. Take it on its face value, and most times you will have God’s truth and be blessed and encouraged. Initially don’t try to dissect it or check several translations. Just read it several times and be encouraged. “David was greatly distressed… but David encouraged himself in the Lord his God” (I Samuel 30:6 KJV). 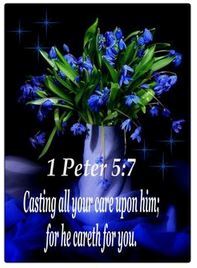 God (verse 6) “cares for you” — that is truth, and truth is reality. So if you fulfill any stated condition, then it is reality in your life right now. A “care” is a matter that right now is a burden or concern to you, something you are anxious and worried about. I’ve often said that unless the word “all” is modified (like “all Americans”), you can study it until you are blue in the face but “all” still means “all.” Not one care is omitted, so it doesn’t matter whether the care is large or small, chronic or casual, your part is to cast it on God, “upon him,” and take your hands off it. And why does he encourage us to take this action? Because he “cares for you.” Its just that simple. No need for two people or even the whole church to share the burden, for once you cast it on him, God has you covered. So let him take care of the situation. Notice that I haven’t strayed from the simple English translation or even turned the page in my Bible, and already I’m too blessed to be distressed! Oh, if the church would teach their attendees to just read the Bible and believe what they read! Now I’d like to take the process a step further with the Bible aids available. Many will have what are called Reference Bibles, with a center column of cross-references or the references across the bottom like footnotes. Study Bibles take it a step further and include a commentary on the text. If you read your Bible on your smartphone you might not have these aids available to you, but you can always ask Dr. Google by entering the verse reference. So using these types of aids, I first discover a parallel verse in the Old Testament: “Cast your burden on the Lord, and He shall sustain you” (Psalm 55:22). This was how God looked after His chosen people Israel, and how He looks after His family now in the Church age. God has a long history of responding to your burdens if you cast them on Him. I also discover that the Greek word translated “casting” or “cast” is only used twice in the New Testament, so that raises my curiosity. 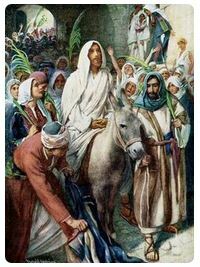 The other usage is in Luke 19:35, “And they brought it [the colt] to Jesus, and throwing their cloaks on the colt, they set Jesus on it” (ESV). Now here is a word picture we can all understand. There’s no pleading with the colt to take their cloaks, the disciples just throw them on his back. So there’s no need to plead with God; just do what He told you to do. How? Tell Him that your burdens now belong to Him. The word “casting” in the Greek has the sense of “once and for all,” the aorist tense (which we don’t have in English). Some translations add those words (Amplified, Weymouth, Vincent’s Word Pictures), and rightly so. You only need to do it once; a second time would be unbelief. Sometimes it is valuable to check what word other translations use, especially if the word used is all Greek to you! I found these words for “casting” in I Peter 5:7: putting, tossing, leave, turn over, throw, let them fall. “To throw upon” is the definition of the actual Greek word. Do you get the message? How much should you throw? “… all your care.” All still means all. Once you throw it or toss it, your hands are empty. Don’t take your care back! Leave it where it belongs. And the word “care” is a good translation. Other words used are “anxieties, worries, concerns” (Amplified Bible) and “troubles.” These are part of the human condition, well-known by everyone, so there is no need to get more specific. Coming to the second part of the verse, we find a different word used for “care,” “… for He cares for you.” The word here means “of interest, or concern.” The Amplified reads, “for He cares for you affectionately and cares about you watchfully.” Obviously a different word was needed because God doesn’t have anxieties or worries. Others translate it simply, “For he cares about you”; “For his interest is in you” (Moffatt); “it matters to Him concerning you” (LITV). Your heartaches, your sorrow he shares. He wants you, He loves you, He cares. For it matters to Him about you. Humbling myself before God. 1 Peter vs. 6. Casting my cares on him for he cares for me. vs. 7. That works. I am not better than anyone else. Thank you for your decades of devotion Peter and Vivien. Love in Christ. Excellent and needed words from God’s superlative and precious Word. So thank you.